Animated screensaver with an evil feel. 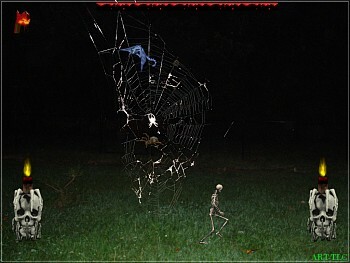 I took a picture of this huge spider with a 5 foot web in my back yard, and added some animations for a cool saver. Spider Image copyright, ART-TLC © , along with others from http://www.animation.arthouse.org/index.html>Animation Arthouse (copyright) included. Halloween music in the background. Happy magic spell casting Halloween! Screensaver copyright, ART-TLC ©. This saver fits any screen size.